By Fred Mandell, Ph.D., & Kathleen Jordan, Ph.D.
Today, more people than ever are thinking of making a life change, reinventing themselves to live more vibrantly, healthfully and creatively -- especially in the latter years of their lives. Becoming a life change artist involves the same skills and creative process that great artists use in their work. To sustain a creative body of work, great artists have seven creative skills in common: Preparation for creative insight, seeing (connections and possibilities), using context, embracing uncertainty, risk taking, discipline, collaboration (engaging with others). Old models of life change have left out the creativity factor. For navigating transition, most people seek the company of fellow travelers on the journey. An important tool for recording your journey is -- in the manner of Leonardo daVinci -- your sketchbook companion to chronicle the aspects of your life change. Old linear maps of life transition no longer are sufficient. While life can get messy, there are four creative dimensions that propel artists through the painting process in a non-linear fashion, that follow the process of being an artist of life change. We begin with our creative dilemma, motivated to discover a new path out of the wilderness of a life challenge. A period of exploration follows, where we experiment or try out something different. We continue on -- to discover what is meaningful for us and what works. It is then that we integrate elements of our past with these discoveries, layering the experiences, but always going through the entire four dimension process, no matter our age. Always there is some creative dilemma attached to any life change. Common creative life dilemmas include our career and work; a cause or calling; relationships; our place in our community, among family and friends; our spiritual beliefs and practices; our health and well being; our lifestyle; our opportunity for creativity; a sense of our own mortality. All our dilemmas call for choices to be made, risks to be taken. Our responses affect other areas of our lives. Creative dilemmas create tension, often uncomfortable. Confronting them means things will be different somehow. Confronting and acknowledging our dilemma begins the journey of discovery and exploration. Taking the first steps on the journey means we need a mindset to think creatively about it. We need to listen to our inner voice and trust the process to clarify our focus. Exploration involves taking action to try different things to address our dilemma. Discovery involves reflection and evaluation of what's working or not. We are never done with our life changes and dilemmas. We must learn how to stay afloat and navigate. Like the great artists, we must explore by doing, trying new things, going in new directions. In the exploration and discovery, we find out who we are, what is our passion and our gifts. When we integrate the four dimensions, our life painting becomes whole and in alignment with our core self. We integrate new skills, new perspectives, new relationships with past experiences. As the great artists know, this quest takes a lifetime and the creative process is ongoing. Integration brings harmony to the painting of our life. The great artist, Cezanne, is an example of the harmony of integration in the creative process over a lifetime. When we integrate the various aspects of our lives, we experience a sense of wholeness and completion and of who we are. Integration helps move us through change, giving us confidence to paint ourselves as we are. Then, when a new challenge presents itself, we begin a new canvas as a true life change artist. The four dimensions that make up life changes mirror the process that the great creative artists go through. Seven skills have been identified to help the artist's journey. Creative ideas come to us as a divergence from our normal work routine. Preparation involves engaging in activities that are outside our normal experience. Regular preparation practice is an essential ingredient in each stage of the four dimensions of our creative dilemmas and contributes to the formation of new neural pathways in the brain. Learning to see yourself, your life, in new ways and with new perspective is the ultimate creative skill. Discerning the layers, the connections between things, seeing in front and behind the canvas and into our internal world, helps us to capture the essence of the life we want to be. We must step back from the canvas, refocus and reevaluate our "negative space" around us. When we tune into its vague shadows, and confront the questions we've been ignoring, we can turn our thinking around, take a fresh look at ourselves, and play with the possibilities. Within the context of our lives, there are social and historical trends, through which we can fashion our unique life painting -- much like the great artists Monet and Picasso worked within the framework of the history around them. As life change artists, we must allow ourselves to live and thrive through the change, embracing the unknown and the uncertain. We can ground ourselves through activities such as healing mantras and affirmations or personal rituals, such as walking. A complementary technique to help embrace uncertainty is mindful floating--being aware and alert to new information. By surrendering to uncertainty, we find unexpected treasures. Life is risky, but risk defines any life change. The great artists risk on a daily basis as they learn to trust the creative process. Life change and transition demands the same. Accepting this allows us to be ourselves and continually align our public and private selves. We wonder if the risk is worth it. We can manage our risk by taking small, incremental steps or changes. Like Matisse, we can experiment with small steps at first, later becoming more comfortable with the boldness of bigger changes. The great artists relied on collaborative relationships to fuel the fires of their creative enthusiasm. By engaging with others, we better able to make life choices through working relationships, collaborative communities, and mentors or coaches. The working relationship of Pablo Picasso and Georges Braque resulted in a revolution in modern art. Together they brought forth a new art form -- Cubism -- considered the forefront of modern art. Collaborative efforts can create something greater and more successful than working alone. Collaborative communities provide the opportunity for speeding up the creation process, like the Impressionist community of artists, whose collaborative work created a movement that would revolutionize Western Art. Key to this collaboration is the emotional support system inherent within the community of artists, giving individual members encouragement and connection to kindred artists. Mentors and coaches, such as Camille Pissarro to Cezanne, Monet, Berthe Morisot and August Renoir -- offer encouragement and support through creative dilemmas. Collaboration via mentors, coaches, advisory groups, or life coaches, allows networking, connecting to new ideas, encourages better decisions, and offers support and accountability. Discipline to keep going in the face of change involves keeping track of our progress toward our goals along with regular activities that renew restore us, such exercise routines, prayer, walking, yoga. Working steadily toward our goals means finding ways to recover from doubt and disappointment, remaining engaged with our dream, holding ourselves accountable to follow through on the choices we've made. Tools we may use include: creating our own personal mantra or affirmation, writing down our commitments and reviewing often, declaring our intentions publically, having a plan to help us bounce back after a setback, not being afraid to set goals, maintaining positive self-talk and avoiding negative chatter, and being aware of our personal patterns. Discipline is the building block of the creative skills, enabling us to follow through on our life changes. Living as a life change artist is not for the fainthearted. To remain true to your creative commitment, despite life's obstacles, requires belief in accomplishing the work you're meant to do, and using the skills that we have to navigate our life circumstances. We can always make choices that support our journey around our creative dilemmas, and through all the four dimensions of life change. Eventually, we find our way, once we've answered all the questions about who we are, and why we are here, and how can we express what's inside us. Great artists, such as Matisse, teach us that there are powerful possibilities waiting beyond our creative dilemmas. As a life change artist, remaining true to ourselves and our purpose is the ultimate path to wholeness. To order Becoming a Life Change Artist from Amazon.com, click here! may be disappointed if you fail, but you are doomed if you don't try." Get out your paintbrush, prop up the easel, and grab your color palette, sketchbook and pencils. Whether you know it or not, you're an artist; it's time to get into the studio -- to draw, design, paint your way through your next life challenge. What? You say you can't change? Oh, but you must. All of life is change, and the sooner we learn to ride the waves, the smoother the changes become. What? You say you're too old? You've lost everything? You've been passed over, your health is failing, the economy has taken its toll on you, you feel totally washed up? So there you are, on the shore of some strange island. What scenery do you see? You don't think you can paint your way back to normal? To a new life that pleases you? Think again. Think like the great artists -- DaVinci, Monet, Cezanne, Picasso. With knowledge, effort and diligence you can wield the paintbrush to your life canvas; you can follow their lead, through the essential dimensions of each life transition. You can explore your options in this territory of your creative dilemma, and with the artists' tools in hand, you have the power to discover what's meaningful, what works. While thinking about what to write about this book, I happened to hear an interview with Tom Hooper, director of the Oscar-nominated film, the King's Speech. Hooper was talking about the main theme of the movie: Finding your voice again. King George VI, a stutterer since childhood, was finding his voice, thanks to the creative efforts of speech coach and mentor Lionel Logue. Suddenly, it struck me. We've seen the film, and I found myself choking back a tear when Hooper said the point is: "You have a right to be heard; and people should bloody well listen." This struck me for more personal reasons, as I realized that for the past four years, I've felt like a kindred spirit to King George and his creative dilemma. As I read through the book -- and through the seven skills of creative life change -- it occurred to me that I'd been experiencing nearly everything discussed. It occurred to me, too, that I've been finding my voice, like King George. I just wish I'd latched on to all this good creativity advice (the authors say that our culture has tended to de-emphasize that aspect) a lot earlier. Thankfully, it's becoming mainstream now, the understanding that to successfully navigate life and all its changes, we must become like artists and use our creative impulses to fashion our canvas. One of the seven tenets, or skills to creatively reinvent ourselves -- tools that artists use in creating their masterpieces -- is Preparation, doing things that prepare the brain to undertake creative work. The authors don't mention this, but I would add to my favorite preparation routine: going to the movies. "Preparation," the authors say, "means deliberately engaging in activities that help us break from our usual patterns of thought and feeling and prepare us for creative insight." Apparently, when I was immersed in the film, my heart was registering that insight about finding my voice. The other skills (seeing with new eyes, using our social and historical context, embracing uncertainty, risk taking, collaboration with others, and discipline) are all skills that the great artists employ in creating great paintings. I was getting quite excited, the more I read through the book, as it seemed I could easily say -- "been there, done that." I took it to mean that I'm making progress in upping my creativity quotient when it comes to painting my life canvas -- getting through the messy paint jobs, and turning out something beautiful. I was excited because reading the book affirmed how glad I was that I'd acted on a hunch four years ago to get some help while navigating a life transition -- a transition from the newspaper office to reinventing myself and discovering who I am, authentically, and what would I be doing about that. I've been learning all these skills, and moving through the four dimensions of this major life transition, using the seven skills. It isn't often I can read a book and feel that I'm affirming something completed, and not grasping at how I think it might help me. Again, thankfully, I can confidently agree with the authors, and recommend this book to anyone who is navigating a life transition and wishes to paint themselves out of a dark corner, into the light. My personal adventure involved a dream quest and workshops on creativity and the healing arts. It may take dramatic effort like this for you to move through challenging life issues. There are plenty of these types of self-help opportunities available nowadays. Like King George, you might find a life coach, like Lionel Logue. My advice is to find something that resonates with you and give it a whirl. 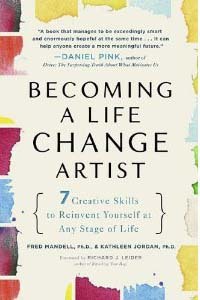 I'd read many books on how to navigate life change, but Becoming a Life Change Artist helps understand the stages and requirements of life change, in the context of how the great artists evolved their work. It's easy to view your life in that context and picture it as a vast canvas to continually improve upon. What would kindle your fire to become a life change artist? What would make you think like DaVinci, and spark your creative spirit? If you find yourself in a major life dilemma, don't just sit there -- well, sit there and contemplate (as that's preparation for your creative work) -- but get out your paintbrush. Ready, set, paint! Your life depends on it.